Observation - Song Thrush? - UK and Ireland. Description: Thrush seen in my garden. I think it's a song thrush. Looking in my book of birds, it looks too fat to be a mistle thrush. Thrush seen in my garden. 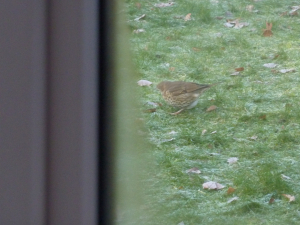 I think it's a song thrush. Looking in my book of birds, it looks too fat to be a mistle thrush.